Overall Bow: 8" x 4" x 2"
Embroidery Design: Spring Flower 3.52" x 3.04"
Embroidered Name is sized per custom order. Say Happy Spring with this great matching set of a white hand towel and bow. 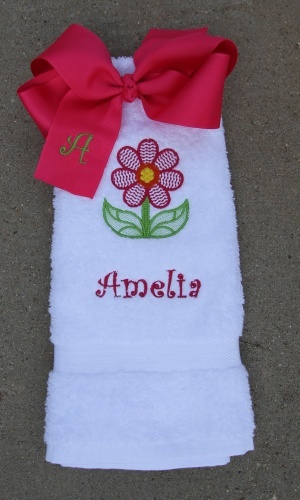 This is a lovely Spring Flower embroidery design with a personalized name on towel and initial on bow. Every little girl would love to call this set her own! The flower has lime green stem and leaves, hot pink petals, yellow and orange center. The name is matching below in a hot pink color and Mono curls font. These colors can change if you need to match your bathroom. The bow has a 1" Initial on the front tail in a lime green color.